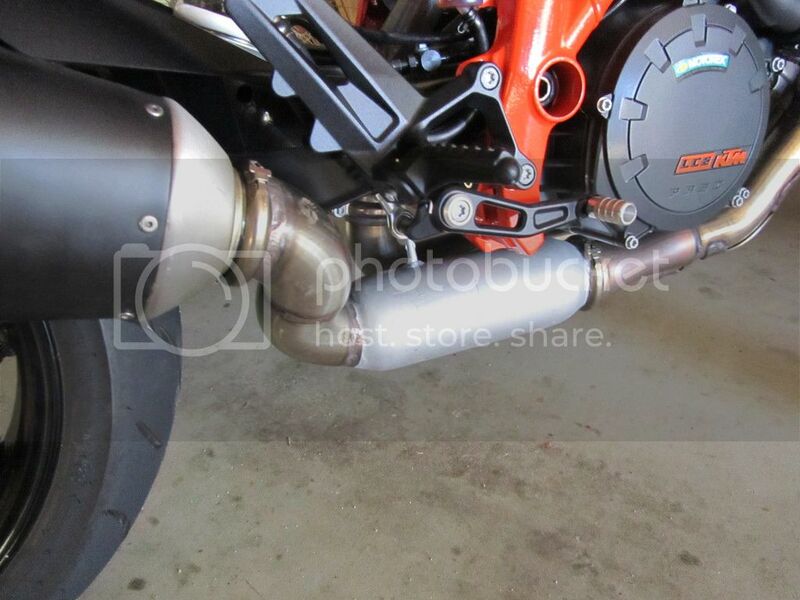 superduke forum • View topic - Decat the 1290! I got the spare cat box today thanks to Scotman623, much appreciated! Got the angle grinder out and had a look how to proceed. Decided to cut along the weld so I can tig it up later without too much giving away. Seems to be the right decision in after making the cut. After making the second cut all around again you need to drill out these 3 welds at the top middle with a 8mm drill. This is how the gas flows. Black in trough the cat, Blue back from behind the baffle chamber via the 3 smaller pipes, red out towards the end can. Ran out of time for now and won't be able to do much this week. Will have a think how to proceed from here to cut the unwanted bits out and create a smooth flow but retain some damping. Cheap improvement for those who want it. Might not be that easy as due to the double skin it will be a pain to modify. Not that heavy when the cat part is out. So if I understand correctly, its a decat with a resonator and a stock look that you are after? Location: Saratoga Springs N.Y USA. Comrade Guy: Looks pretty similar to the arrangement that Scottsduke revealed on the 990. I also did that at one stage and eventually concluded that the amount of argon I'd used wasn't worth the effort. Still nice to know what's inside. It always amazes me how small that hole is that goes backwards. No wonder these bikes feel like they want to breath more freely from the factory. The akra system has a big pot in the middle, where the cat is on the original, is a resonator. That was the last step I was going to take after the rest, will do it with a bend like the bodis. I do this as an experiment and we'll see what works the best. jmann wrote: Comrade Guy: Looks pretty similar to the arrangement that Scottsduke revealed on the 990. I also did that at one stage and eventually concluded that the amount of argon I'd used wasn't worth the effort. Still nice to know what's inside. It always amazes me how small that hole is that goes backwards. No wonder these bikes feel like they want to breath more freely from the factory. 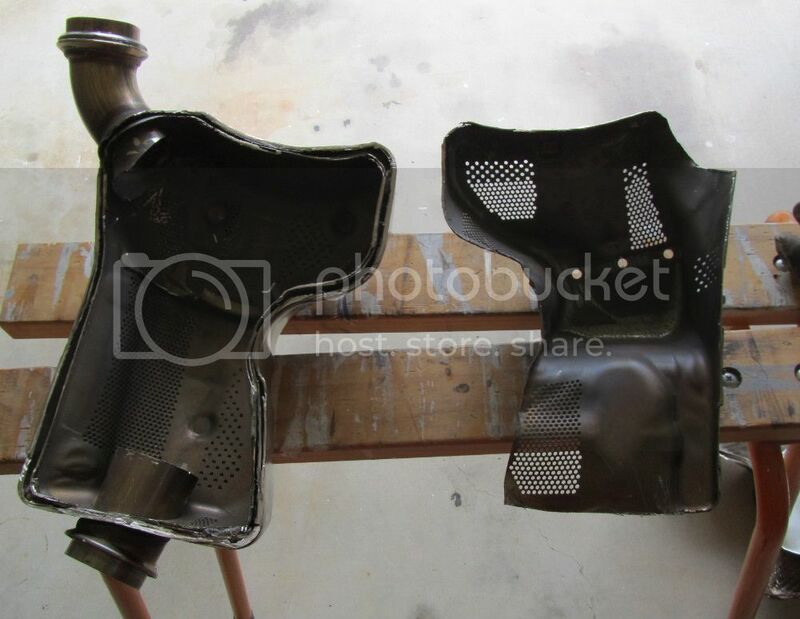 I would be tempted to weld a piece of half round pipe between the flanges and weld another piece of perforate pipe to mate to the half round pipe. 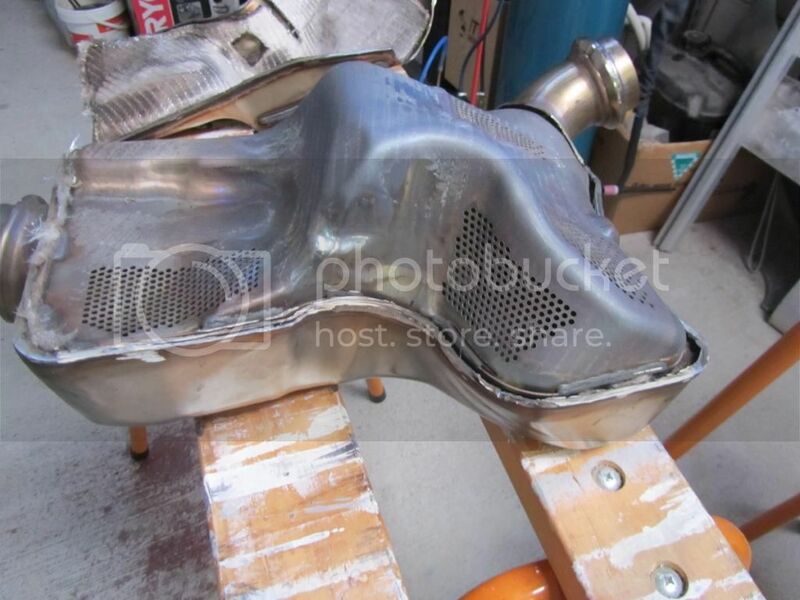 Then just gut the cavity and you have yourself a resonator chamber that looks stock. Just upgrade the can and map and you have a cheap complete system that supplies adequate back pressure so you keep the strong midrange. Keep us posted on your progress Guy. 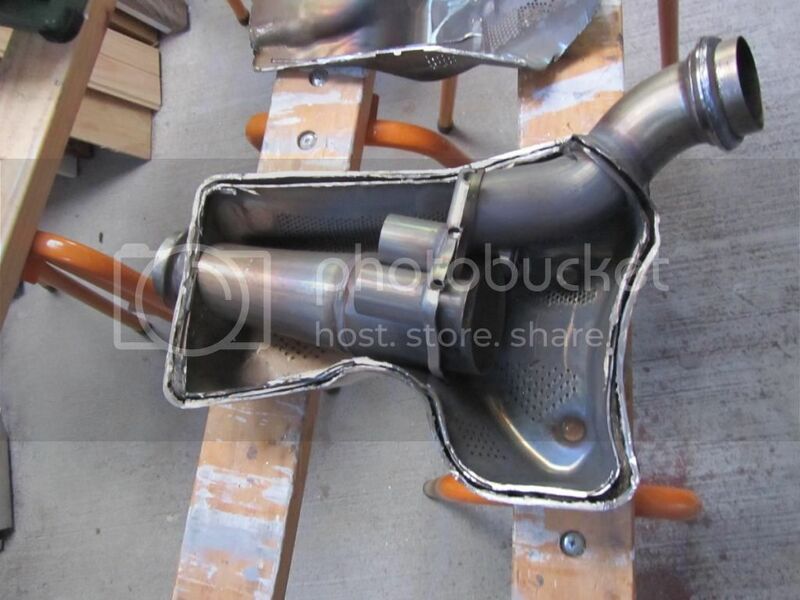 abc wrote: I would be tempted to weld a piece of half round pipe between the flanges and weld another piece of perforate pipe to mate to the half round pipe. 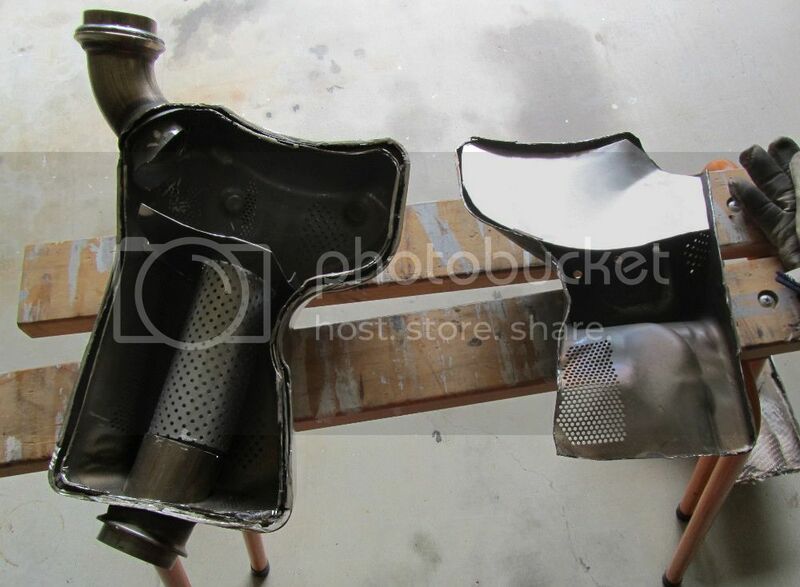 Then just gut the cavity and you have yourself a resonator chamber that looks stock. Just upgrade the can and map and you have a cheap complete system that supplies adequate back pressure so you keep the strong midrange. Keep us posted on your progress Guy. 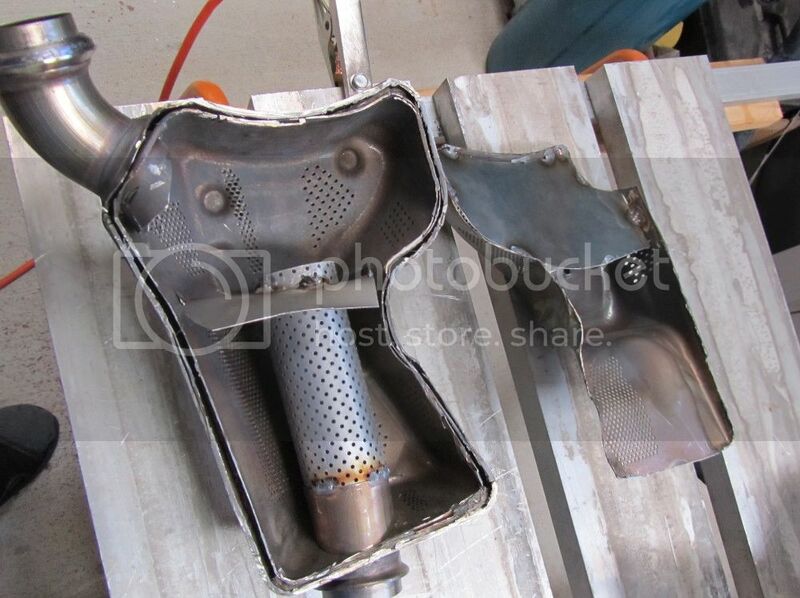 I had a think about it last night and the plan so far is: Take the cap out and stick a 63mm perforated pipe where the cat is till the separation, fit a new plate there where the original is. 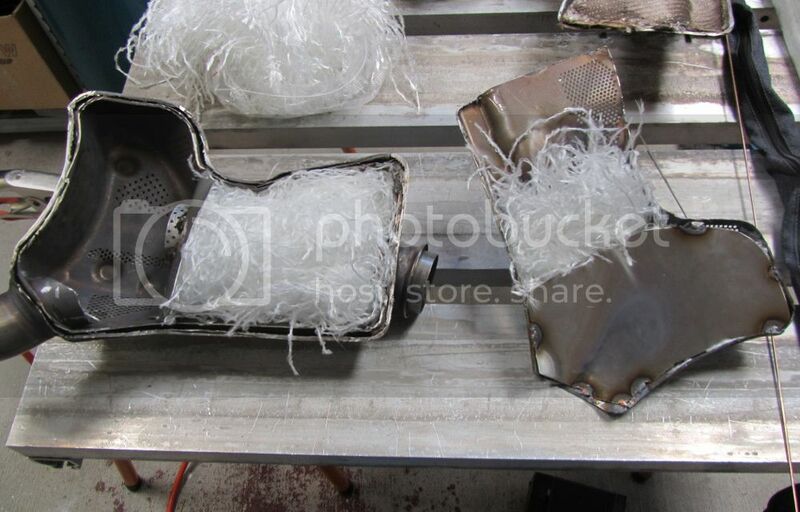 Insulate that part with stainless wool and exhaust padding. In the back cut the pipe flush with the wall and close it back up. The last section will be another chamber than. I doubt that I can do anymore on it this week. Tomorrow is 2x400km to the dealer and the rest of the week I need to make a gate in stainless or aluminium. I only did this to prove a point and prevent others from making the same mistake! Mock up of the parts, idea is to insulate the top of the cat box to keep the swingarm cooler and to keep some noise damping. Also want to keep it simple. No it's not unless you really want to keep the original box for legal purposes or so and load the akra map, otherwise forget it! Buy a Bodis instead! Does it make more noise? I compared with the original can and it does a bit but not much. Again, not really! It is a mission to cut the pipes out as they are hardened due to the heat cycles in the cat, the top bit you can get to with the angle grinder but for the rest you need a dremel or airtool. Anyone commenting that my welds are ugly, go and F yourself!! I only learned to TIG weld last year from http://www.weldingtipsandtricks.com Great site, thanks Jody! 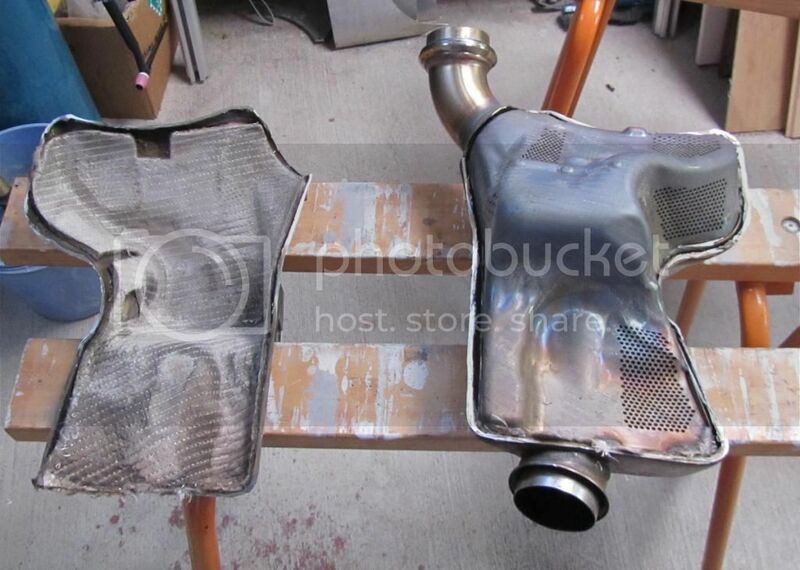 Did you consider leaving it empty so it can act as a large resonator similar to the Akra Resonator. 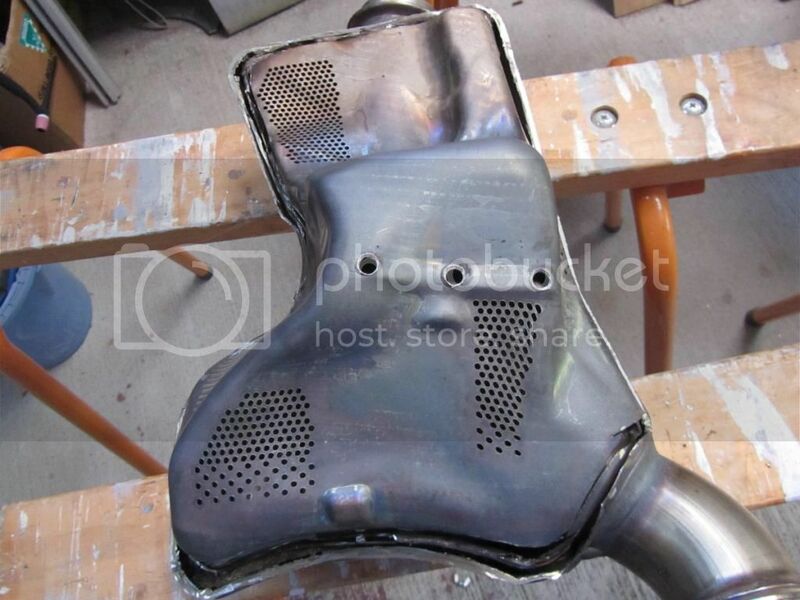 Then just run it into the stock can with centre baffle removed as a budget improvement. The Akro resonator chamber is basically and open chamber with a perforated half sectioned tube running along its length in the direction of the flow. Interesting mod you have completed though. Yes I did think about that! Main reason why I didn't is the exit tube out, If you look closely that is the most restrictive part and also the smallest diameter. Unless I change that all the rest is in vain. No reason to go any further on this just for that alone. Interesting exercise but pretty pointless performance wise, doesn't even sound better. Thanks for your efforts on this Guy! New prototype decat. Home made. 2 x 63mm (2.5 inch) 90 degrees elbows in 304 stainless. Cut flanges of original cat. Sounds really good, not as noisy as bodis but with nice low rumble. I didn't have black heatproof paint, I'll paint it in black when I take it off again. Looks a neat job KTMGUY. I wonder how it would compare with the arrow version or similar? (volume wise). HYPERMOTO wrote: Looks a neat job KTMGUY. A few things are different. It is almost impossible to get the correct 57mm (2.25 inch) pipework here in Oz. 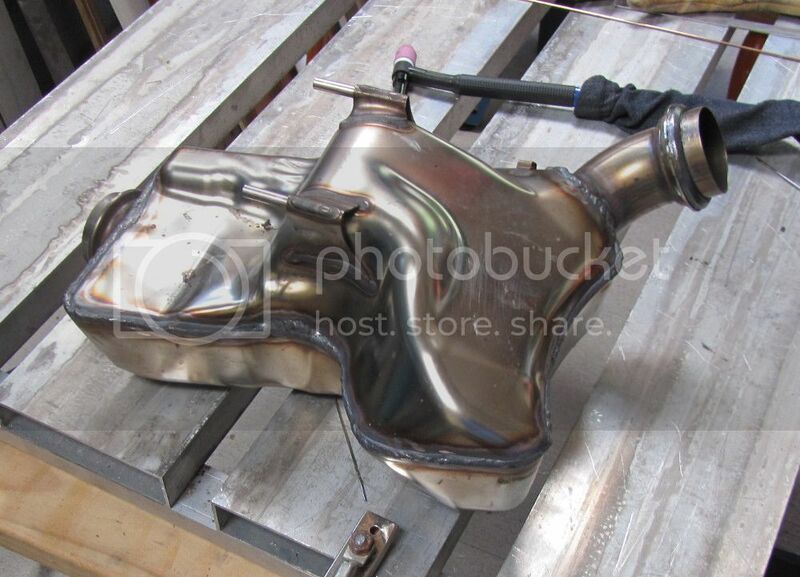 I can't even get the thin wall exhaust grade stainless here. 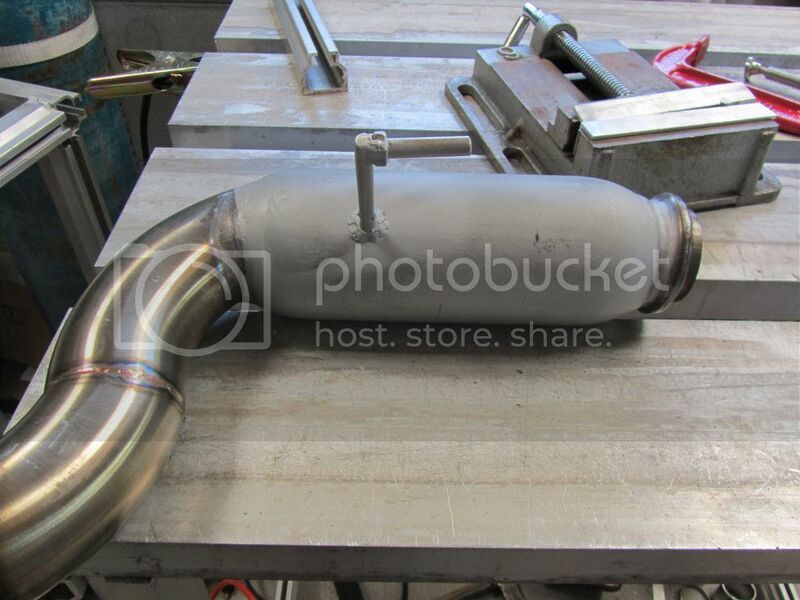 In New Zealand I could just get that from the local muffler shop. So I had to use 63mm (2.5 inch) stuff so the resonator is a fair bit bigger than the arrows. I need to put it on the dyno to see what it does, might do that soon. The seat of the pants dyno is a bit confused at the moment as balancing the throttle bodies made it much smoother so it feels slow but looking at the speedo it doesn't. The speedo is also different due to replacing the rings, so all up need to recalibrate a bit. Next ride I'll do a sound file. 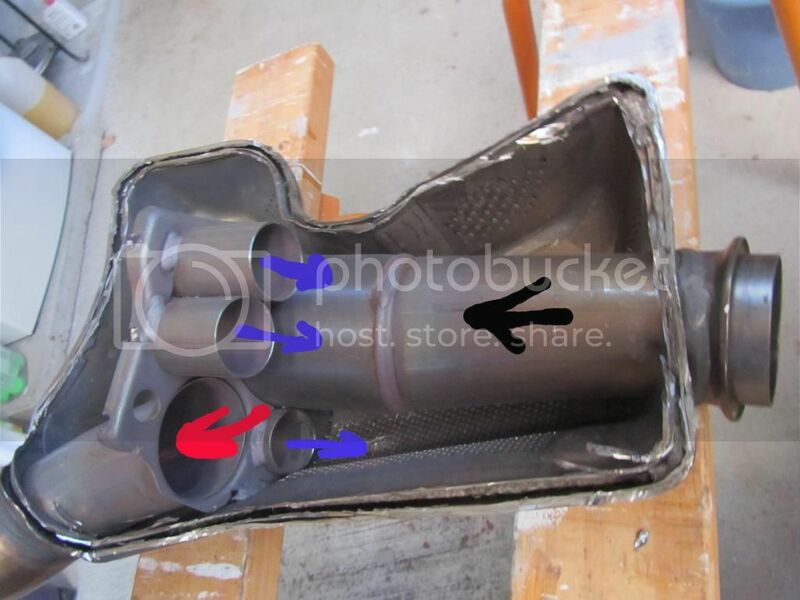 So would it be possible for me to bang out the honeycomb which I assume is located in the first large pipe going in (shown in your pic with the black arrow)? That honeycomb converter has to be restrictive. Thoughts? tonyteeth wrote: So would it be possible for me to bang out the honeycomb which I assume is located in the first large pipe going in (shown in your pic with the black arrow)? That honeycomb converter has to be restrictive. Thoughts? It's not the honeycomb (cat) itself that is restrictive, it's the labyrinth at the back. Follow the arrows in the picture and it becomes clear.